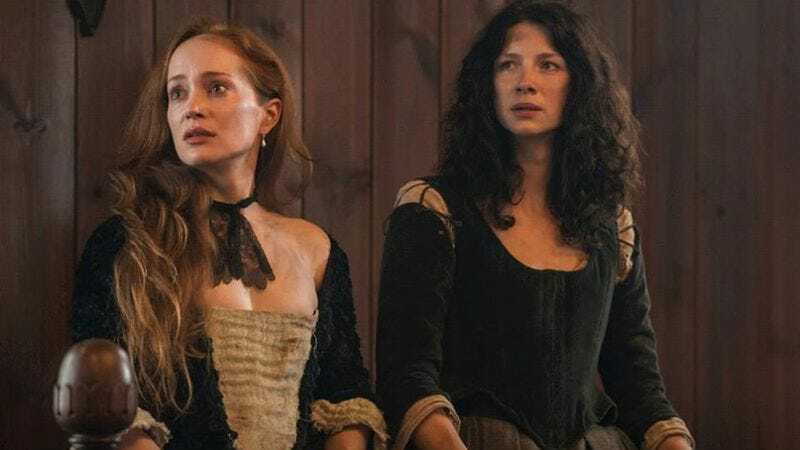 TV Line reports that Outlander has sent out a casting notice for the character Brianna, who is introduced in the second book in the series, Dragonfly In Amber, from which season two will take its cues. In Dragonfly In Amber, there’s a major time jump that brings Claire to Jamie’s 20-year-old daughter Brianna, also called Bree. But her name isn’t Brianna Fraser; it’s Brianna Randall. Because she is her father’s daughter, she’s described as ginger-haired and tall. The official character description also notes that she’s an American twentysomething who’s “strong-minded, intelligent beyond her years with an effortless charm and sparkling sense of humor, traits inherited from both her mother and father. She also has a scholastic mindset, with a healthy dose of American strength, having been born and bred in Boston under the watchful eye of professor and historian Frank Randall.” The casting notice calls for actresses 5’8” and over who can play the character as “earthy and grounded and not girly” and “with the inexperience and vulnerability” that comes with being a twentysomething. And you don’t even have to be a natural redhead. The casting call also hints that Outlander might be going slightly off book for season two. In the novels, she enters at the beginning of the second installment in ’60s-era Scotland, but the casting notice says that “Brianna has secretly followed her mother back in time to find the father she never met and the family she never knew.” This storyline is something that happens in the books, but not until the fourth, Drums Of Autumn., suggesting season two might blend arcs from both of these books. Season one similarly made small departures from the original source material along the way, most of which made the story and characters even better. So if the Outlander writers are changing things, they probably have a good reason. In any case, Bridget Regan is at the top of our list for dream Briannas, if only because we want to see Bridget Regan show up on every television show possible (she pulled double duty on Jane The Virgin and Agent Carter last television season). Plus, we already know she looks great as a redhead.